Well the chill is in the air, the tree is up, the outside lights hanging, and I’m listening to Christmas music! What better way to cap off a week of decorating by making a cute little stocking ornament for your tree? The design team has been hard at work making stockings all this week to help get you in the spirit. 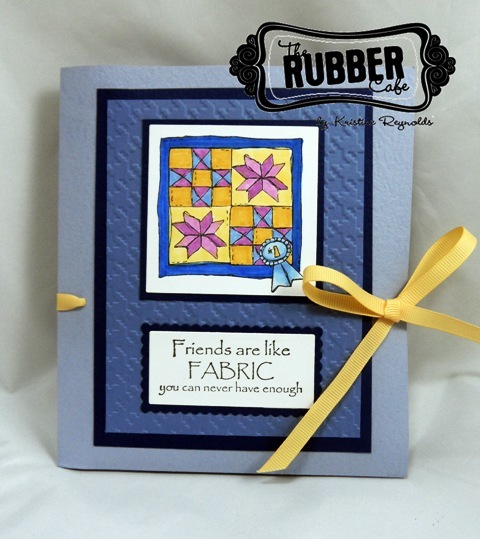 I hope you’ve had some time to get in your craft room and play along with us as well. 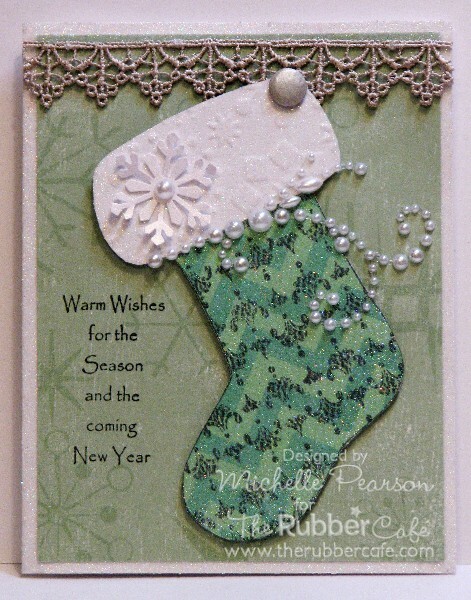 I wanted this stocking to have a vintage shabby chic feel and I challenged myself to use Melissa’s AMAZING background stamps! These are definitely my go-to stamps to give life to all kinds of projects. For my project, I used the H978 Background Basics 2 Polka Dot stamp and the EP200 Stampendous Adhesive Powder to adhere the gorgeous G108 Your So Fine Diamond Clear Cool Highlight glitter. I heart this glitter. It is so baby powdering fine and it sticks so well to the adhesive powder. I was even able to outline the edges of the patterned paper. Just in case that isn’t enough sparkle for you, I also used the 121007 Crystal Clear Jellie Dots along the edge of the dainty little pom-pom ribbon I had in my stash. Isn’t that just beautiful! It looks so sparkly on my tree. So there’s my little stocking sitting perfectly in the tree. You could also make these to use in a garland as decoration too. The possibilities are endless. 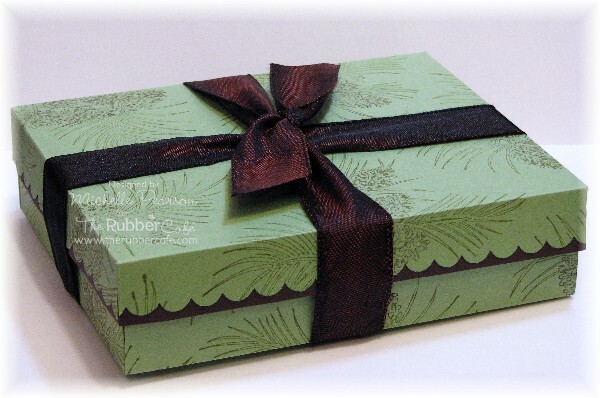 I hope I’ve inspired you to use your products in new and different ways or to simply try a new technique using the fabulous products in The Rubber Café store. Hi everyone, thanks for stopping by. This weeks challenge is "Stockings", it was left up to us to use our imaginations as to what that meant. As you can see from the posts the other DT members have been doing, there are endless possibilities. My take on this challenge are these two socks. One is a decorative card and the other is a gift card holder. On this sock I used my BIA to bind the cuff of the stocking so I could flip it up and have a sentiment stamped on the underside (see second photo) I stamped the Winter Bird on cream Pugnacious Paper and colored them with copic markers. I put some Glossy Accents on the red berries to add some shine and I fussy cut it out and popped it up on the corner of the cuff (it actually hides a bird that was on the patterned paper). I stamped the Pattern Royale background stamp on more cream card stock and trimmed it out to make the toe and heel of my sock. I distressed the edges with ink using my Lil inkers and then used Scraphappy glue to attach it on. 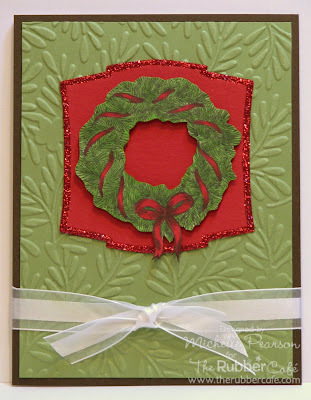 On the inside flap I used a sentiment stamp from the Christmas Tidings set. 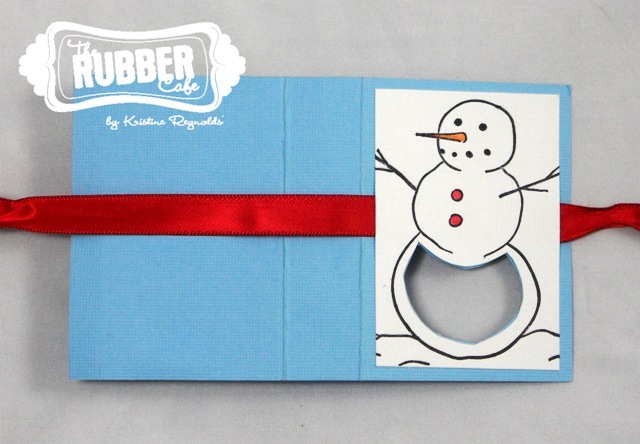 I was thinking under the flap would be a good place to put a gift card or maybe a photo as a surprise for the recipient. 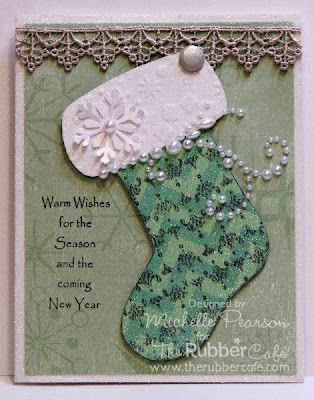 This little guy got stamped with the Pattern Royal background stamp as well but all over the sock (it's smaller than the previous stocking) I made this one into a gift card holder by attaching a coin envelope to the back with some One & Only tape. I wrapped some ribbon around the gift card so when the recipient pulls the ribbon the card comes out. I used a sentiment stamp from the Christmas Tidings set inking one word at a time so I could fit them on my scalloped circle punch out. I then attached some nestabling to add some sparkle. Hope you've enjoyed our challenge this week, don't forget to check in daily to see what's new. Hi all! Happy Monday! I’m here with a stocking for this week’s theme. My very first stocking (stockings are not a big thing in Sweden). So fun to make, I’ll make more!!! It’s a card in a stocking shape. I drew a template by hand and when happy with it (wanted a round and chubby kind of stocking) I cut it out from a regular kraft card base. It’s base is rather flat so it can stand up by itself. The top is decorated with the Spellbinders Floral Doily Accents and some twine with a pearl. A bit of burlap tucked in too. And the main focus is this cutie pie! Shooting Star Warren. Totally ADORABLE! He is colored with Distress inks and got himself some cinnamon stickles on the dark part of his fur and some Glossy Accent on eyes and nose. The stars are also covered with Glossy Accent. 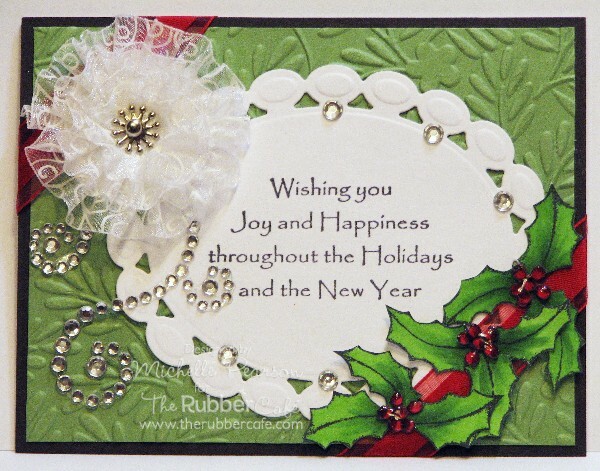 Sentiment is from the Warm Wishes set. I decided to go simple vintage for my card. 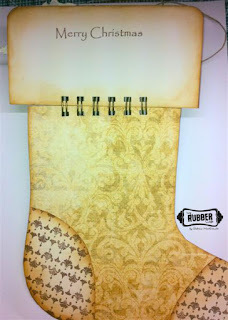 I grabbed a stocking template off of the internet and printed it out on some designer paper from My Mind's Eye. I stamped the image with Pattern Royale and then cut it out. I ran the stocking through my Xyron machine and then applied You're So Fine Diamond Clear Glitter. 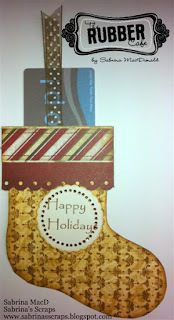 I also applied the glitter around the card panel and on the embossed stocking cuff. I used a piece of Candi to *hang* my stocking. I used the sentiment from the Warm Wishes set. 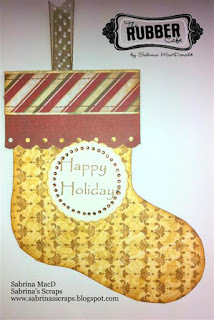 Other card details: Clound 9 Designer paper, Prima Lace and Pearls, Martha Stewart snowflake punch. 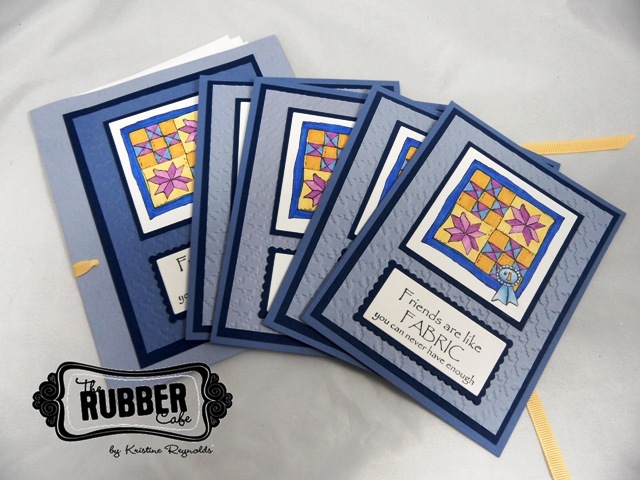 I have been holed up in my craft room all weekend stamping away while hubby watches football! I hope you've had a chance to do some crafting too! 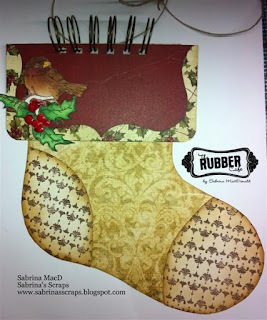 This week the design team is sharing projects that are "Christmas Stocking" inspired. This first one is a Center Step Card. You can see that the colors were inspired by this stocking paper by 3 bugs in a rug. I used one of the newest Rubber Cafe stamps, Warren and Frosty. The sentiment is from the Christmas Tidings set. Here's another view that shows the steps better. And here is a close up look at Warren and Frosty. My second project is a fun little goodie to throw into a stocking. 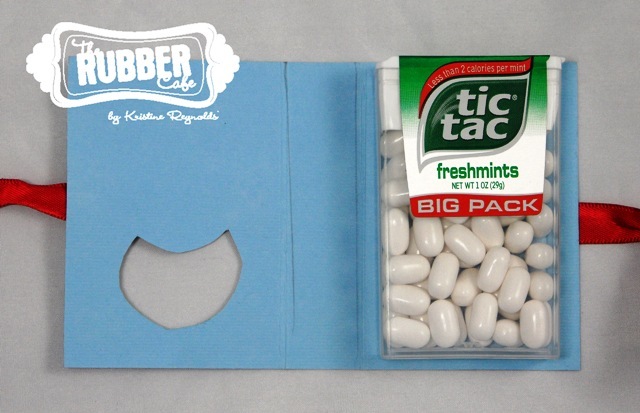 It's a little Tic Tac holder. I like to make up a bunch of these and keep them in a basket by the front door to give out to visitors who drop by during the holidays! 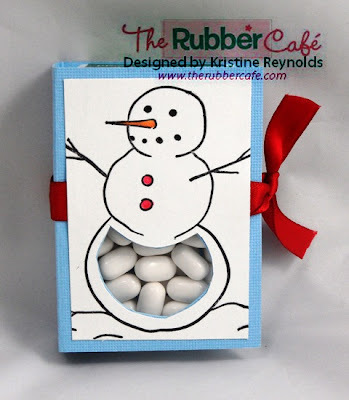 These are really quick and easy to make! 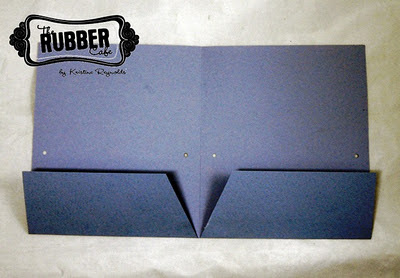 Start with a 5" x 3" piece of light blue cardstock. Stamp the snowman from the "Baby it's Cold Outside" set from The Rubber Cafe onto a 2 3/4" x 1 7/8" piece of white Pugnacious Signature paper. Score the blue card stock at 2 1/8" and at 2 7/8". 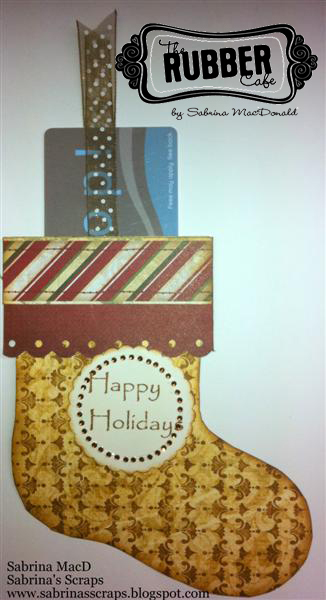 Adhere ribbon to backside of card. Color image and adhere to front. Use a utility knife to cut out the lower portion of the snowman. Then just attach the Tic Tac box to the inside and tie the ribbon. All the snowmen dance and feel alive. You will find little droppings from their cracks. Eat one, eat two and have sweet dreams tonight! Eat some and have good dreams tonight! have not been very nice. Since I'm "up here" in Canada and not enjoying a day off stuffing myself silly with Turkey and all the trimmings, I thought I'd pop on here and wish everyone a Happy Thanksgiving to all of my neighbors to the "south". Any of you going to brave the crowds tomorrow and try for some crazy Black Friday sales?? There is no way I could ever handle that...uh nuh no way, not for me! Well you know, if you're like me and can't handle all the crows or rather just choose not to, Melissa has some awesome deals on over at the store so you don't even have to get out of your jammies. 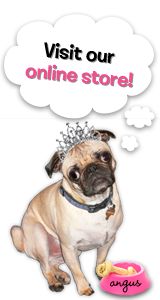 Just go to www.therubbercafe.com or click on the link on the sidebar of the blog, go to the store and shop your little hearts out, get some great deals and never even have to leave your home. How GREAT is that!!!!! I am so glad that you stopped by to see my project . 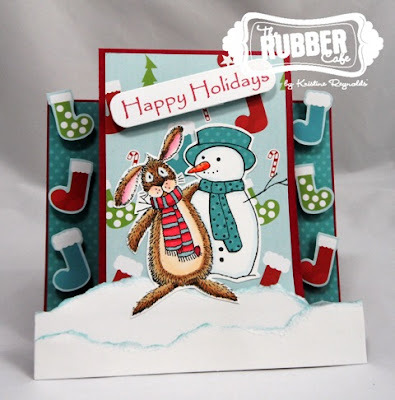 This week the Design Team ladies have been sharing Card Sets for gift giving. I made a set using Quilt Ecstasy by The Rubber Cafe. This is the folder that the cards are in. It will hold 4-6 cards and envelopes. To make the folder for the cards you start with a 8 1/2" x 11" piece of cardstock. Score at 5 1/2 inches on the 11" side. Score at 2 1/4 inches on the 8 1/2" side. 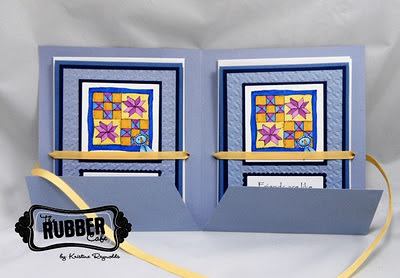 Fold on the score lines and then cut out the V.
Thread the ribbon so that it holds the cards and envelopes in place. Here is a close up look at one of the cards. I used Scrap Happy Glue to securely hold everything together. 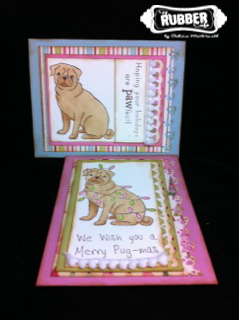 The images are stamped on Pugnacious signature paper and are colored with copic markers! I hope you've enjoyed our card set inspiration this week. Check back again to see what we are doing for the next challenge! 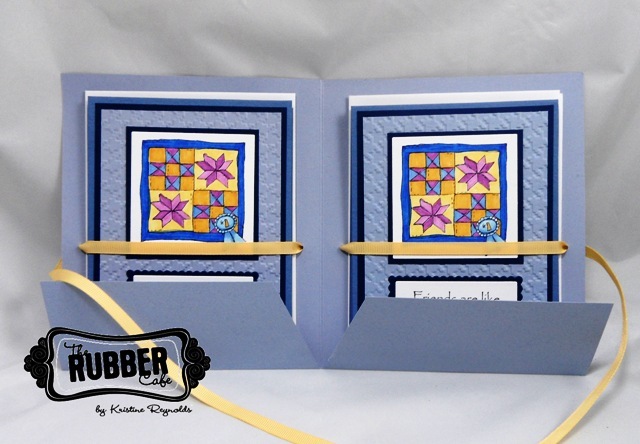 I made these two cards as part of a gift set for this weeks challenge. I must admit though I feel a little lazy compared to the other girls with them making matching boxes and envelopes LOL. Anyways I used the stamps from "A Pug for The Holidays" and "Bah Hum-Pug"
I colored them with Copics and mounted them on cardstock and again on pattered paper. I used a couple of border punches I had (Threading water and a paw print one) and using One & Only tape I adhered some pompom trim. I made one Pouch (template found on SCS HERE) and three cards and home made envelopes to go. The stamps are from the Warm Wishes set. Michelle here with another card set for The Rubber Cafe...today's set is a boxed set of A2 cards. I followed the tutorial on SCS for the A2 Card Box. My first card features the Winter Bird image which I colored with Copic Markers and then fussy cut. I layered it on a Spellbineer's Beaded Circle and embellished it with some embossing folders and snowflake punches. My second card features images from the Christmas Tidings set. 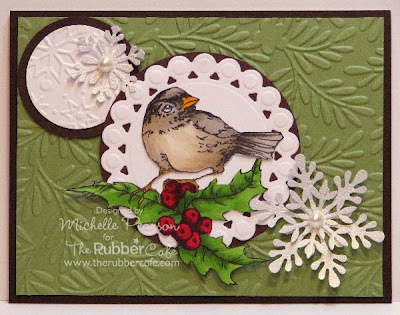 I added a ribbon rosette, some gems and some glaze to the holly berries. 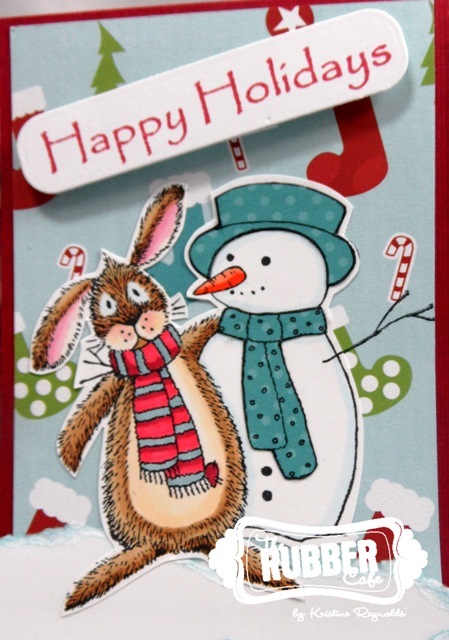 My third card features another image from the Christmas Tidings set. I added some You're So Fine Diamond Clear Glitter. 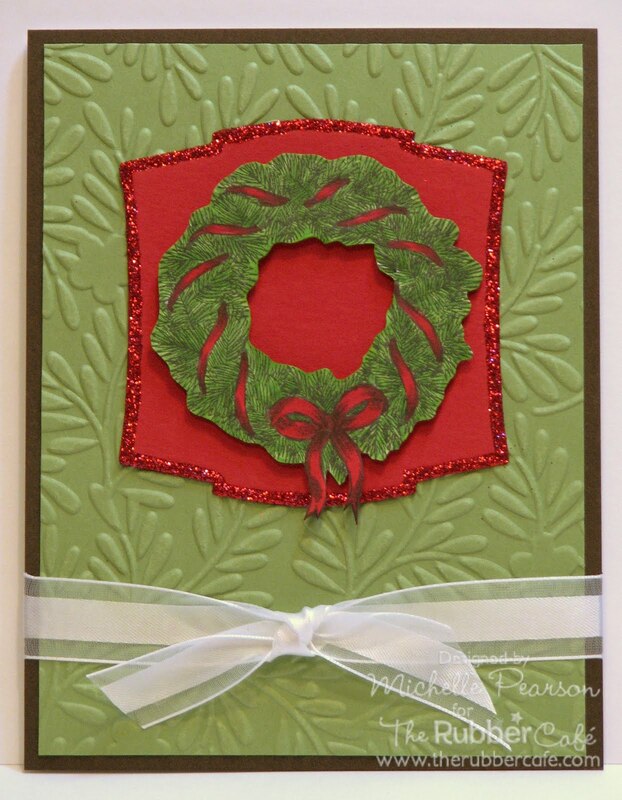 My fourth card features the Pine Wreath which I colored and fussy cut. 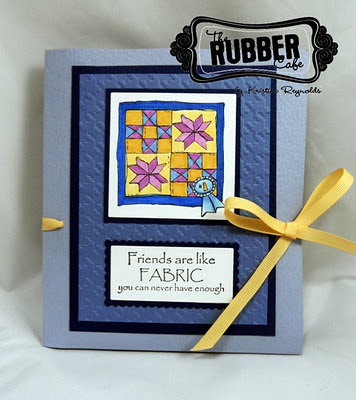 I layered it onto Spellbinder's Labels Three. And finally, here is the gift box with the cards/envelopes enclosed. 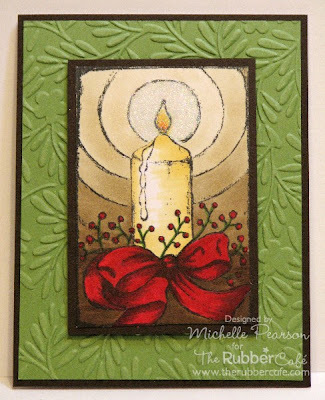 I stamped the cardstock with the Pine Bough image which I inked with Tim Holtz Peeled Paint and Walnut Stain Distress Inks. I hope you were inspired by the fun winter images I showcased on this set! Gift Idea: Card Set to Go! 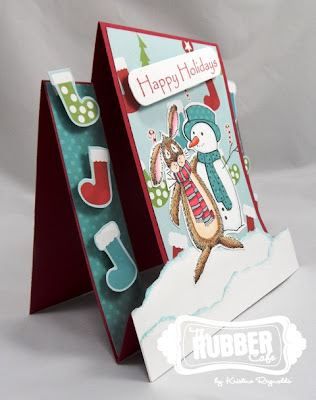 I really love this week’s challenge to make a card set for gift-giving. There are so many possibilities with this one that it was hard to narrow down what I wanted to do. Then I saw this Card Pouch tutorial over at Splitcoast Stampers and I completely had to stop what I was working on and do it instead! Do you ever do that? Stop in the middle of a project and change course? Well I’m sure glad I did. This little pouch is super easy to make and it came together quickly. I’m going to be making more of these to keep on hand for emergency gifts and also I think my daughter’s teacher will really enjoy something like this too. 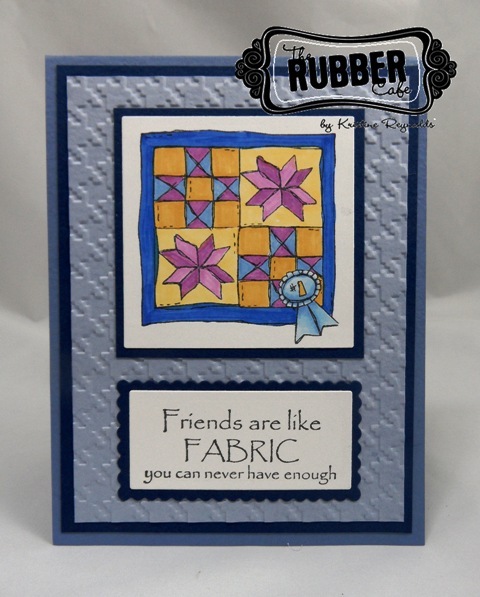 For the little cards I used the sentiments from the J-1095 Fabulous Phrases set. They fit perfectly in one of my hole punches I had in my stash. Here’s a look at the inside of the card pouch. The card fits nicely inside. One other thing I got to play with was the T000-0001 Goosebumps texture spray. This product is so much fun! Just spray it on and let it dry. Easy peasy! I wanted the outside of my pouch and the cards to look like they were covered in melting snow. 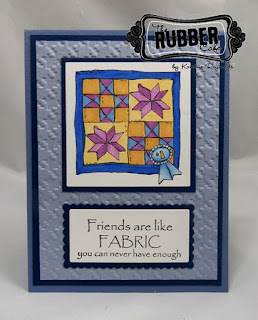 This technique is great to do if you don’t want to have the look of embossing but want something fun for a texture. It does look like melting snow doesn’t it?? You can really see the texture and the lovely sentiments in these photos. The ‘Get Well’ card is using less spray and the ‘Thanks’ card behind it is using an all over application of the spray. Well I hope you’ve enjoyed my project this week and are inspired to create your own. There’s just a little over a month left before Christmas and it will be here before you know it!